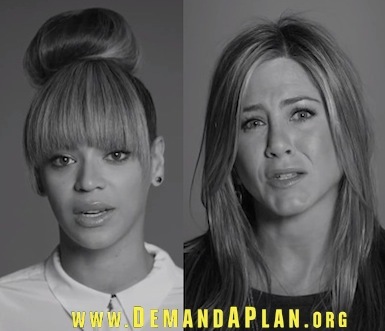 Julianne Moore, Paul Rudd, Cameron Diaz, Reese Witherspoon, Jon Hamm, Jessica Alba, Chris Rock, Michelle Williams, Courtney Cox, Jennifer Aniston, Steve Carell, Beyonce and many more have come together to deliver an important message on gun control. The PSA was put together by Demand A Plan, which was launched by the collective Mayors Against Illegal Guns after the tragedy in Newtown, with a goal to change America’s lax gun laws. Their website includes an option to sign a petition that ultimately looks to ban assault rifles, make gun trafficking a federal crime and criminal background checks a requirement for potential gun owners. If celebrities can make people buy lip gloss because of some interview with Glamour, you’d hope they could also help to make gun control “trendy,” not as a discussion or argument, but as an action.